UMT is pleased to announce that Mr. Ben-Johan F. van der Walt and Mr. L. David Olson were selected as UMT's 2014 Distance Education and Training Council (DETC) Outstanding Graduate and Famous Alumni respectively. Each year, DETC conducts its Outstanding Graduate and Famous Alumni programs to recognize the achievements of the millions who study at a distance today. Both of Mr. van der Walt and Mr. Olson's stories have been published in the 2014 DETC Outstanding Graduate and Famous Alumni book and are included below. 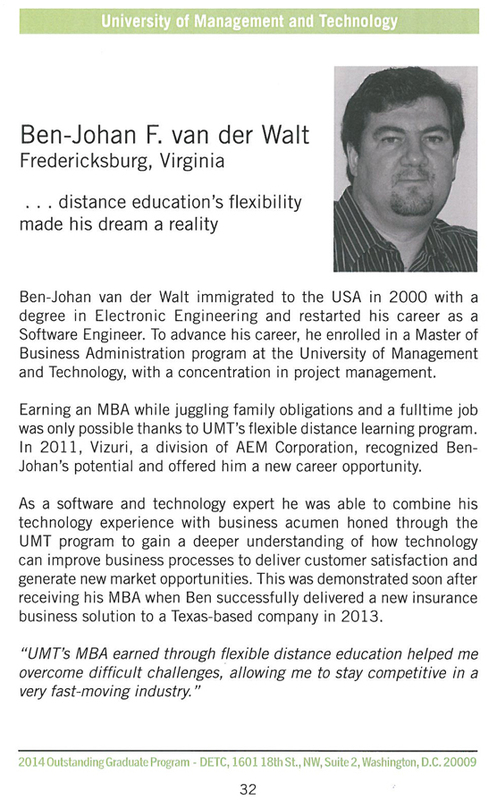 "...distance education's flexibility made the dream of obtaining an MBA a reality"
Ben-Johan van der Walt immigrated to the USA in 2000 with a degree in Electronic Engineering and restarted his career as a Software Engineer. To advance his career, he enrolled in a Master of Business Administration program at the University of Management and Technology, with a concentration in project management. While juggling family obligations and a fulltime job, UMT made a Master's degree possible with their flexible distance learning degree programs. In 2011, Vizuri, a division of AEM Corporation, recognized his potential and offered him a new career opportunity. As a software and technology expert he was able to combine his technology experience with business knowledge gained through the UMT program to gain a deeper understanding of business processes and how technology can improve those processes to deliver customer satisfaction and to generate new market opportunities. This was demonstrated soon after receiving his MBA when he successfully delivered a new insurance business solution to a Texas-based company in 2013. "UMT's MBA earned through flexible distance education helped me overcome difficult challenges, allowing me to stay competitive in a very fast-moving industry." 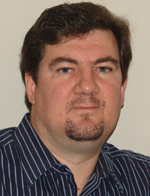 L. David Olson was working in an engineering services company as a Project Manager, holding a Project Management Professional (PMP) certification. To strengthen his skills as he progressed up the managerial ladder, he enrolled in the University of Management and Technology's online Doctor of Business Administration program, emphasizing Project Management. 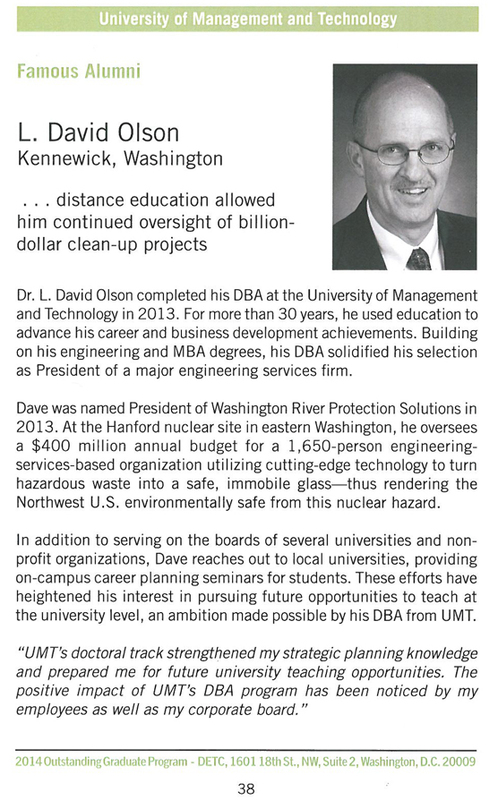 Dr. Olson's Doctorate in Business Administration solidified his selection as President of Washington River Protection Solutions in 2013. At the Hanford nuclear site in eastern Washington, Dave oversees a $400M+ annual budget for a 1,650-person engineering-services-based organization utilizing highly-specialized, cutting-edge technology to turn hazardous waste into a safe, immobile glass — thus rendering the Northwest US environmentally safe from this nuclear hazard. In addition to serving on the boards of several universities and non-profit organizations, Dave reaches out to local universities, providing on-campus career planning seminars for students, heightening his interest in pursuing future opportunities to teach at the university level, now made possible by his DBA degree from UMT. "The University of Management and Technology's doctoral track strengthened my strategic planning knowledge and prepared me for future university teaching opportunities. The positive impact of UMT's DBA program has been noticed by my employees as well as my corporate board."